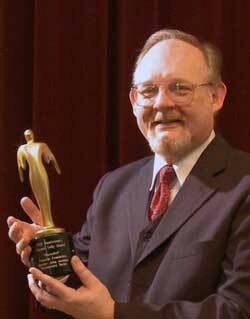 Wesley director John Jackman was honored with a 30th Anniversary gold Telly Award last month in recognition of his direction of the 2001 documentary miniseries Zinzendorf. The four-part miniseries about 18th century religious visionary Nicholas Ludwig von Zinzendorf was broadcast on the Hallmark Channel, and is available on DVD from Vision Video. The special gold Classic Telly Awards were given this year as part of the 30th anniversary of the peer-judged Telly Awards. The award recognizes exemplary work over the past thirty years.